Hannah Berry is mostly a graphic novelist, but she is also a writer, illustrator, occasional lecturer and editorial gun-for-hire. She has been a tutor for the Arvon Foundation’s Graphic Novel Writing course, as well as being the Booktrust’s seventh Online Writer in Residence. 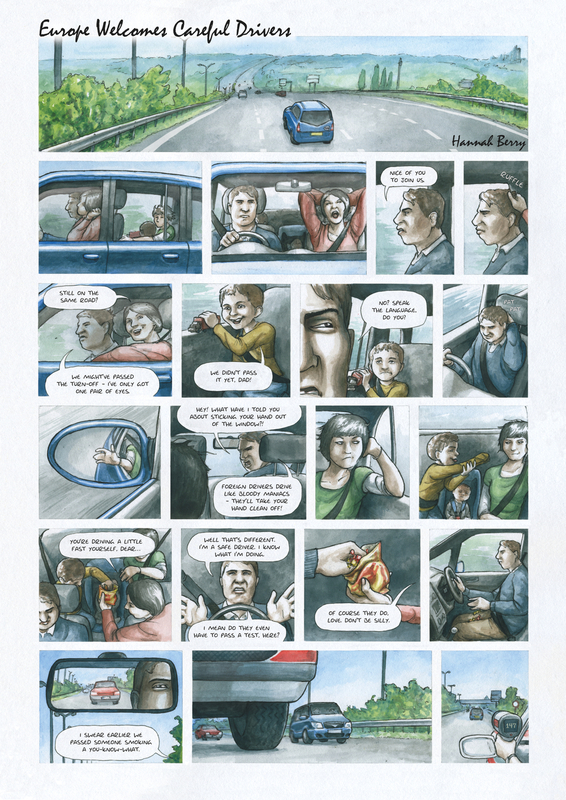 Her first graphic novel BRITTEN AND BRÜLIGHTLY was published by Jonathan Cape in 2008. It has been translated into Italian, Dutch, Serbian and French, with the French edition chosen as part of the official selection for the 2010 Angoulême International Comics Festival. Her second graphic novel ADAMTINE was published in 2012, also by Cape. She has exhibited work in solo and collective exhibitions and has written for publications including the New Statesman, Dazed & Confused and the Huffington Post UK. I suppose I’m rather proud of my country, and, in the approved manner of my countrymen and women, I celebrate it with absolutely no outward display of pride at all. The only time when it is socially acceptable to be proud is on the subject of Europe – being synonymous with the European Union – which often spirals into a strange ‘Us’ and ‘Them’ attitude. As if we were our own separate continent. Among those of a certain age and a certain attitude, cries of “how dare They stop us from doing what we want?” “Did you hear They want us to buy and sell only straight bananas?” and “Don’t They know who we are? We ruled most of the world once...” are repeated until an embarrassing chorus of Rule Britannia breaks out. The mainstream media portrays the EU as unwanted babysitters. Where we used to have an empire, now we sit swaddled and coddled and stripped of our individual freedom. Those of us who have stopped to think about it in terms of the global picture and in terms of the future tend to be more behind the whole concept. The debate as to whether we stay or leave the EU rages on. But I think it was the point I heard the European Court of Human Rights discussed with haughty contempt as nothing more than an interfering bunch of bureaucrats on a primetime BBC1 chat show when I realised that, actually, maybe we are in need of babysitting. At the country’s wheel, there are people who... shall we say... look after their own interests. Interests that do not coincide with the best interests, or sometimes even the rights, of citizens. And while the EU represents for many people a barrier in their absolute freedom to manoeuvre, it represents for the rest of us the last line of defence for our human rights. I shudder to think of life without it.